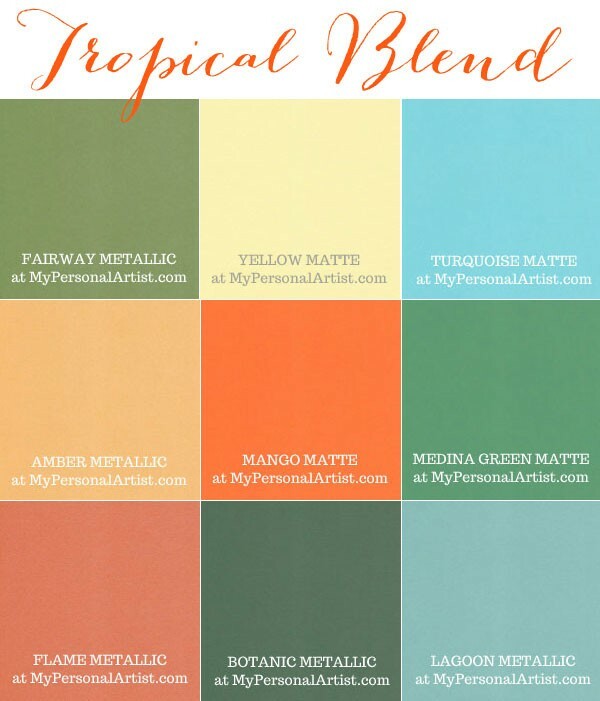 I don’t normally share all of my clients invitations or inspiration / color mood boards, however this tropical blend was so gorgeous not to share! As you can see, at My Personal Artist we have a lovely array of colors and options for tropical invites! The combination of colors are truly endless. 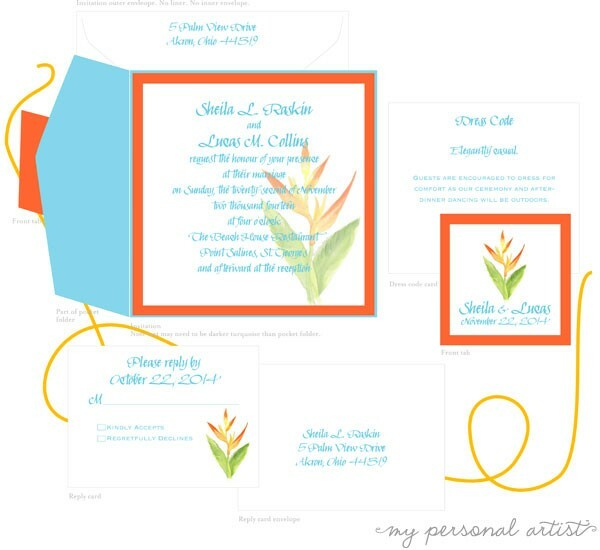 This post was created for Sheila (a lovely stylish bride-to-be) to view the color cardstock options available for her tropical wedding invitations folders. I call this mix of tropical colors TROPICAL BLEND. 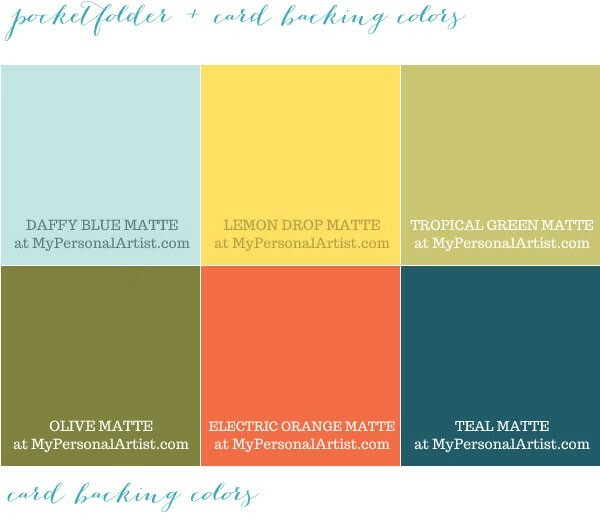 I find this color combo to be softer than normal pop of hot pink hues tropical blends. Botanical and earthy with a splash of sea. So very beautiful! 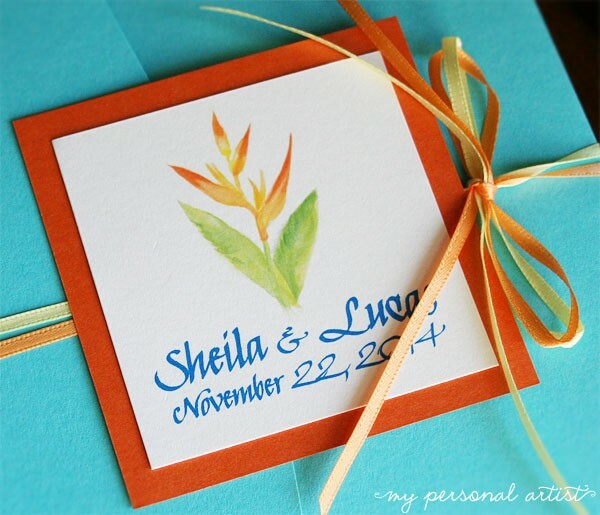 UPDATE: Sheila’s custom tropical wedding invitations design. (Private details changed for publishing purposes.) I hand-painted the heliconia in watercolor. 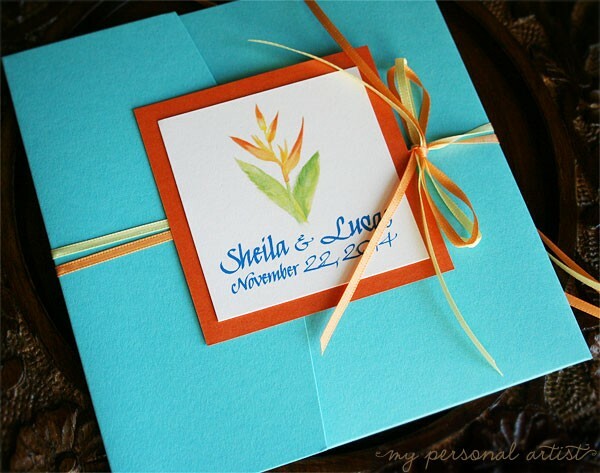 Turquoise Blue and Mango orange married with bright white thick cardstocks. Perfectly tropical! Shown above is the actual Tropical Blue matte finish pocketfolder with Orange Flame metallic cardstock (I do not have the ‘Mango Orange’ in my hands at the moment) with Baby Maize Yellow + Orange Cream ribbons. Now my mouth is watering. Yummy tropical colors! 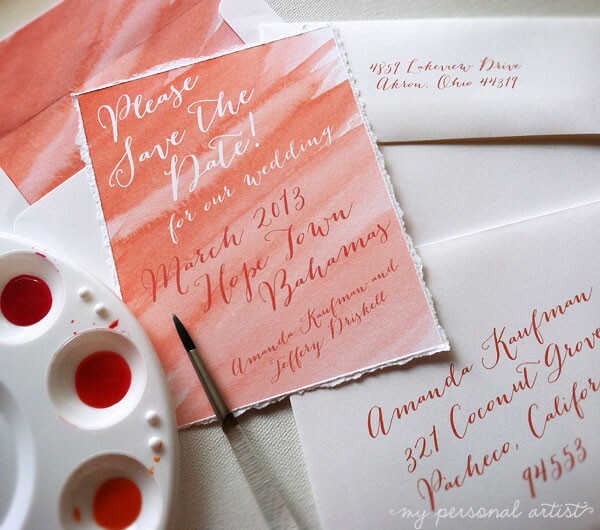 Modern beach wedding save the date cards featuring broad watercolor brushstrokes perfect for a tropical destination wedding! 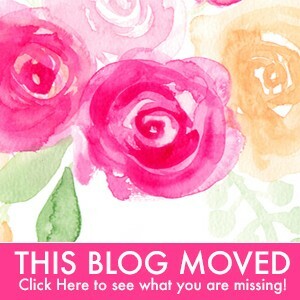 You may have heard this before… We loved the watercolor trend so very much that we did it OVER 10 years ago! Recently, when Carson asked me to create a watercolor save the date card for her daughter’s wedding in the Bahamas I was in LOVE! Of course I took on the “challenge.” Why in quotes? It was my job as a designer and artist to take this ‘current trend’ and modernize the look, give it a twist to make it mine. Well the watercolor technique is HOT again this year and continuing to be hot for 2013. In 2004, one of the first watercolor wedding invitations I did was similar. I know, right? That was a WHOLE decade ago. Well, I guess like fashion trends, wedding invitation trends come back! So much fun and quite lovely if I may say so myself. 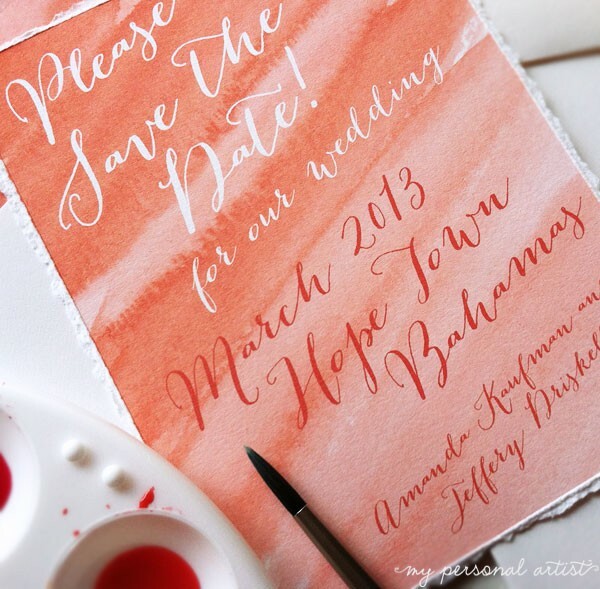 Coral watercolor brushstrokes married with hand-torn edging create a modern beach chic style! The paint flows perfectly like the seashore kissing the sand. These wedding save the dates will make a splash! 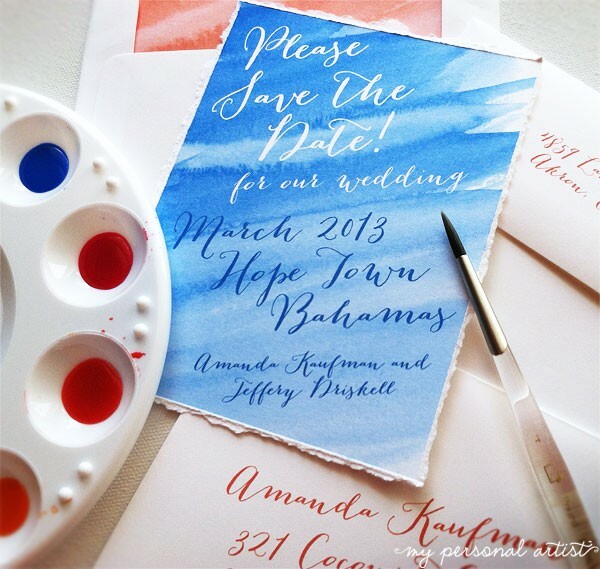 Blue watercolor paint is also a perfect choice for a destination wedding at the beach or tropical venue. Now that the watercolor is created, I can easily change the color to green, aqua blue, mint, fandango pink, red, khaki brown, beet red, purple, and more! Remember, to send out your save the date cards 8-12 months in advance. Questions or if you are in LOVE and want to order now, call me! M-F 330-606-8274 or go ahead and email me directly michelle@mospensstudio.com. As with all of our designs you can customize the design with your favorite fonts, colors, and more! 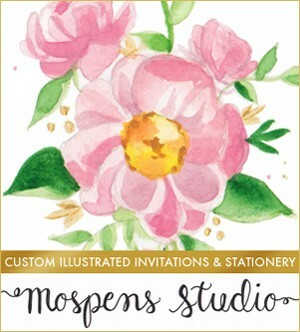 Thank you all for your business and loyalty to Mospens Studio Custom Invitations, we are celebrating 14 years this month! Feel free to enjoy our specials going on now!!! Not only will you get high quality stationery you will also save. Enjoy!! !